Próxima fecha de inicio: 2 de mayo. Modalidad: 100% a distancia, sin horarios fijos, en el entorno de un campus virtual. 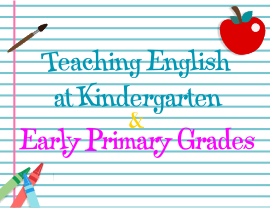 The aim of the course is to provide practical and easy to implement resources and techniques to teach English to children. This Course shares real-life examples which will help you to develop your Very Young Learners teaching and to enjoy it more! Target: Teachers at Kindergarten & Preschool, Teachers at Early Primary Grades (1st- 2nd- 3rd grades), Teachers to be, Coordinators and Head of Studies, Parents. Grace Bertolini is an experienced Teacher of English as a Foreign Language. She attended courses on Learning Organizations, Multiple Intelligences, Classroom Management, TPRS, Cooperative Learning, Learning and the Brain, Social Emotional Learning, Conflict Resolution and Positive Discipline in England, USA and Spain. She studied other languages such as French, Italian and Portuguese and she has studies in Physical Education. She has also got a Neuro Learning Degree that has allowed her to incorporate tools for brain-compatible learning, positive educational environment and multiple intelligences. 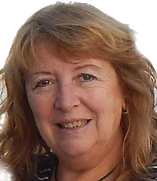 For more than 35 years she has taught all levels and ages at bilingual schools, Private Schools of English and she is former Kindergarten & Primary Head of English at Highlands School in Buenos Aires, Argentina. She is a Bilingual Facilitator for Peace Education Foundation (USA), a Certified Positive Discipline Classroom Educator for Positive Discipline Association (USA), and she lectures on Social Emotional Learning, Conflict Resolution, Classroom Management and Positive Education at school. At present, she delivers courses for Asociación Educar para el Desarrollo Humano and ECO: Escuela de Coaching Ontológico in Argentina and for Cambridge University Press in Chile. As CREATIVE TEACHING Director, she designs e-books for Kindergarten, Primary and High school classes and she delivers Professional Development Workshops and Courses nationwide and abroad on Teaching EFL effectively. Argentina (pesos argentinos): 3 cuotas de $1.200. Abonando en un solo pago: $3.000. México (pesos mexicanos): 3 cuotas de $1.050. Abonando en un solo pago: $2.670. Otros países (dólares estadounidenses): 3 cuotas de US$55. Abonando en un solo pago: US$140. España (euros): 3 cuotas de €48. Abonando en un solo pago: €122. Argentina (pesos argentinos): 3 cuotas de $1.000. Abonando en un solo pago: $2.500. México (pesos mexicanos): 3 cuotas de $860. Abonando en un solo pago: $2.190. Otros países (dólares estadounidenses): 3 cuotas de US$45. Abonando en un solo pago: US$115. España (euros): 3 cuotas de €39. Abonando en un solo pago: €100. El curso Teaching English at Kindergarten & Early Primary Grades ha sido desarrollado para todas aquellas personas que por motivos personales, laborales, de distancia o que deseen estudiar con una amplia flexibilidad horaria y sin desplazamientos, puedan realizarlo disfrutando de las ventajas que proporciona esta modalidad. Duración: 12 clases divididas en 3 meses. Disponés de 1 año para completar la cursada. La periodicidad de las clases es semanal y se accede a través de un Campus Virtual. De esta forma, no es necesario estar conectado en ningún horario específico, dándole al alumno la posibilidad de leer el material en su tiempo libre. La evaluación final esta desarrollada y contemplada para ser realizada y corregida totalmente a distancia: la fecha de entrega pueden ser coordinadas con su tutor. Más información sobre la cursada: clic aquí. The topics developed in each unit will be clearly explained, accompanied by photos, drawings, graphics and a wide variety of easy-to-use teaching resources. The units will have a variety of examples of activities to work with both young children and young people. Each week you will also receive extra reading material suggested, as well as videos and websites recommended for these ages. Duration: 12 units in 3 months (12 class). Always remember how kids learn! Some problems teachers may face. Long and Short Term Planning. REFERENCE CHARTS: Weather Chart - Clothes Line - Calendar - Rules Chart - Helper Chart - Agenda. Making and using hand-made resources. INTERACTIVE BOARDS: Felt Board – Magnet Boards – Chalk Board – Pocket Chart – Word Bank – Bulletin Boards. Young Learners and the importance of “PLAY”. Dramatic Play in Learning Centers. Teaching Resources: using Total Physical Response. The benefits of using Games. How do I set up a game. Board, Card & File-Folder Games. Guide to make your own VISUAL RESOURCES. How to work with Posters. Flashcards as an excellent learning tool when teaching kids. Working with REALIA to teach Vocabulary. The benefits of working with PUPPETS. All kind of puppets: stick, finger, glove & paper puppets. Making puppets with your children. How to perform a Puppet Show. Making and using Masks and Headbands to create characters. How to use simple RHYMES & POEMS in class. Techniques to foster a love for Rhymes and Poems. Using Visual Props: stick puppets, stand-up figures, poetry box, poetry cubes. Poetry Posters with picture clues. Using Music in your classroom: rhythm, rhyme & melody. How to teach SONGS to little kids. Using Visual Props with songs. The importance of Action Songs: movement & gestures to illustrate meaning. Working with LEARNING CENTERS: how to organize your groups. Storing your material. Implementing Rules. Literacy Center: Reading & Writing Center - Math Center. Designing activities: skills & concepts, step-by-step directions and variations. Some conditions to promote Language Acquisition. 10 Helpful questions in determining appropriate texts. GRAPHIC ORGANIZERS as an aid to understand information. Why using Graphic Organizers with little kids. Story/Star Diagram, Chain of Events, Story Maps. Anchor Chats in your class. Character map, KWL Charts, Five W’s Chart, I Can Charts & Family Trees. Using Videos: criteria to choose the content and teaching strategies. Using Technology to empower Young Children. STORY TIME: Reasons to use Stories with little kids. Story Telling & Story Reading. How do I choose the right kind of story? Procedure to read a story to little kids. What can we do Before, During and After reading a Story. Ways to complement your Story Time. Story Time Area & Attention Grabbers. Retelling with Puppets, Masks & Headbands. How to use Felt and Magnet Boards in your Story Time. Using Story Aprons and Retelling Vests. Story Tins and Retelling Cubes. Show your work: organize a Book Day. Book Sharing Schedule: day-by-day planning. Making alternative, self created books to target specific reading needs. Pop- up, Flip-flop, Zig-zag books. Story Boxes & Story Baskets. Dealing with Social issues in class. Resolving conflicts in a constructive and positive approach. What conflicts can kids have in class? Building a Community: me, my family, my friends. Getting to know each other: celebrating differences. “Rules for living in agreement”. I-care Rules for little kids. Understanding and resolving problems. The Peace Table. Dealing with emotions: managing anger effectively: options for “calming down”. Steps to Effective Listening: we are good listeners. It’s time to show your work: Project Work, Book Fairs, Green Week. How to organize your Open Class. Detalles: privada, otorgada por Asociación Educar para el Desarrollo Humano, entidad reconocida por la Inspección General de Justicia I.G.J., del Ministerio de Justicia, Seguridad y Derechos Humanos de la República Argentina. Personería jurídica número 000815. 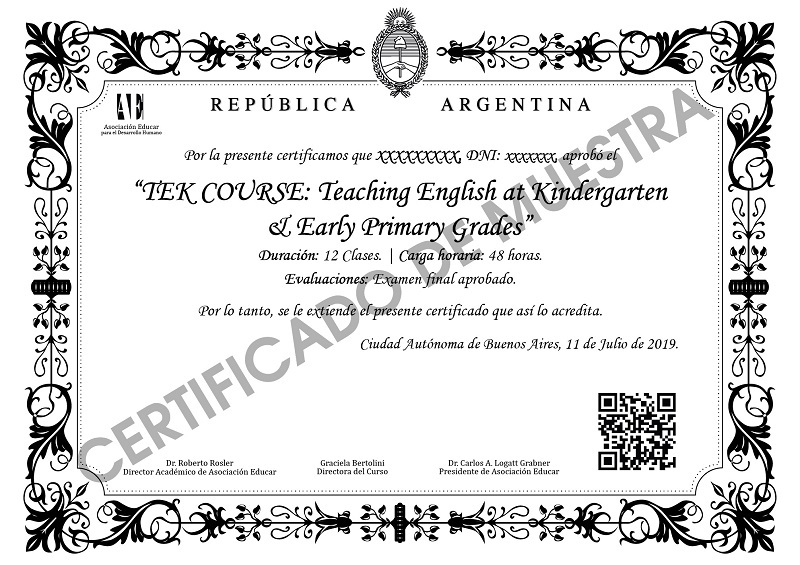 *El certificado digital (en formato PDF) no tiene costo. En el caso de solicitar la certificación en papel, puede ser retirada en nuestra sede de la Ciudad de Buenos Aires, Argentina, de forma gratuita. Si se requiere el envío postal, deberá ser abonado por el alumno.